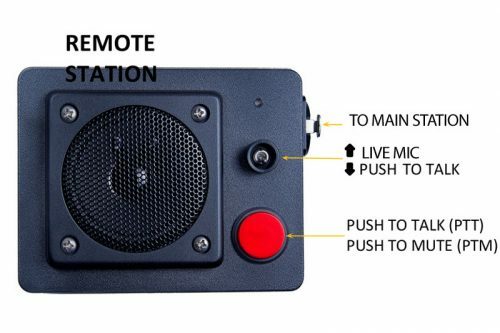 The 2Can Communicator is a wired intercom system designed especially for Video Assist Operators for communicating with a director. It offers a unique combination of high quality, great utility and simple operation, at a low price. A base station at the Video Assist location connects to a remote with a single microphone cable for fast setup. Excellent audio quality allows clear and effortless communication. 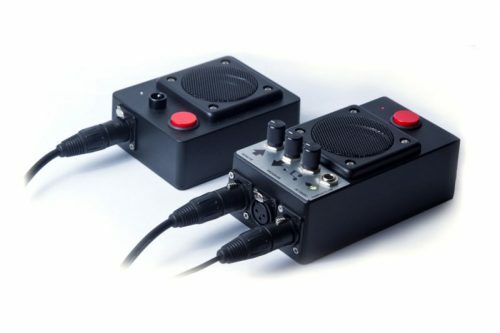 A boundary layer mic captures comments and conversations at the director’s station so you stay in touch and prepared. Top notch components and rugged design assure reliability. Operates on 12VDC and can be powered from any battery type or cart power. An AC supply is included. Remote station requires no external power. A single standard microphone cable to the base station does it all. 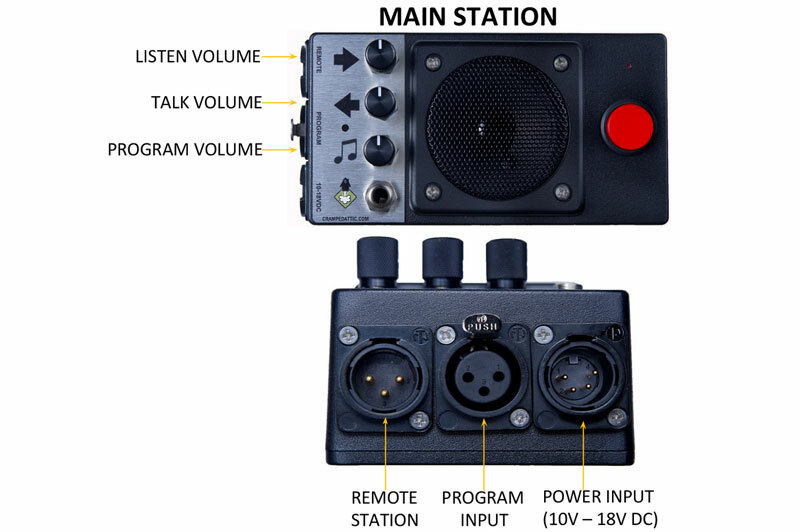 Remote station has two modes, Push to Mute (PTM) and Push to Talk (PTT). PTM is the normal setting: the director’s mic is always live, press the big red button for privacy. A front panel switch can select PTT for those who prefer that mode. Director’s and Operator’s volume level are independently settable at the base station. Front panel ¼“ headphone jack on base station. Speaker is muted when headset is plugged in. Rugged construction. Die cast enclosures, Bourns potentiometers with ¼’ metal shafts, Omron switches, and full size Neutrik XLRs for power and audio. Power requirements: 10 to 18VDC. 100mA idling (approx. 1W), 500mA peak (6W). Power connector: 4 pin XLR male pins, pin 1 negative, pin 4 positive, industry standard. Cable length to remote: Tested with 200 feet of Canare L4-E6S. Longer cables may be used, but test before use. Remote cable type: Standard shielded pair mic cable, pin 1 shield. Program input level: -20 to +10dBm for full volume. Hi-Z balanced input.